I wanted to wait a good amount of time after using this product to give my opinion. And now that it has been a few weeks..Let's Talk! Here are the facts. Organic coconut & hibiscus w/ coconut oil, silk protein, & neem oil. 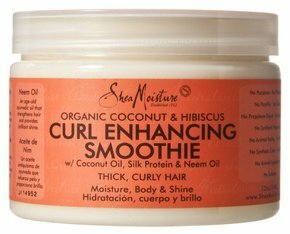 Provides moisture, body & shine to thick, curly hair. Water, shea butter & coconut oil are the first 3 ingredients but all of them are pronouncable. Nutrient rich vegetable butters condition hair, restoring moisture & shine. Pros: It does exactly what it says it will do. It enhanced my curls. I have never seen definition like that and it lasts all day, no need for gel or anythng providing an extra hold. It smells like heaven and the consistency is everything i ever wanted in a curly hair product. Its very thick and creamy but not pasty at all. It really does give you body and volume and bounce. It was very moisturizing but i apply it wet so i dont know how it feels on dry hair. Cons: The only thing i didn't love about this product is that it really didn't give my hair any shine.. I added another product for shine after I noticed that it was kinda dull. Overall: I LOVE this product. You all know that I am not much of a product junkie but now that my hair is at a length that I love I have been branching out and trying new products and i love that i started with this one. Only $10 at Target..I definitely rate this a MUST HAVE!